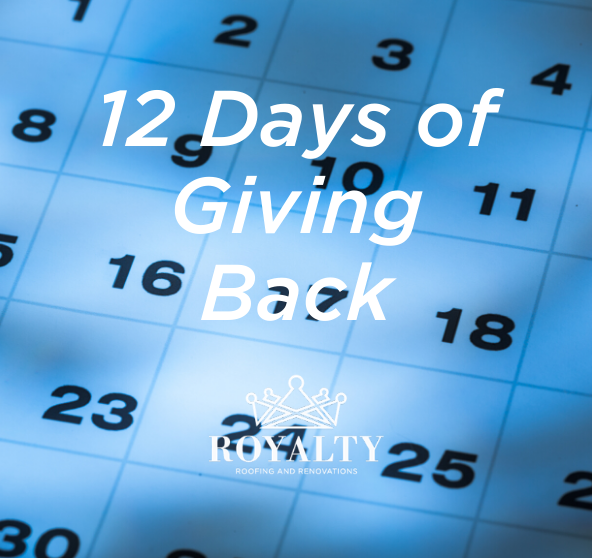 12 Days of Giving Back Recap - Royalty Roofing "
At Royalty Roofing, customer service is what drives us. But we are also committed to serving our community. During the 2018 holiday season, our team created and participated in a 12 day long event where we highlighted and volunteered at various community organizations. We encourage you to get involved too! In this blog, we’ll provide a quick recap of the organizations that we featured and let you know how you can get involved and help further their respective missions. Did you know that two hours of bell ringing at a Salvation Army red kettle raises about $60 in donations? The money goes straight to Salvation Army’s programs to help provide basic needs, housing, youth services, rehabilitation, counseling, and spiritual care to people in the Omaha metro area. Though you see a lot of the red kettles during the holiday season, the need doesn’t end there. The Salvation Army needs help year round. Learn how you can help. The Food Bank for the Heartland. Did you know 1 in 5 kids under 18 in Nebraska and Western Iowa are at risk for hunger? The Food Bank for the Heartland provides emergency and supplemental food to help eliminate hunger in our community. In order to keep their great programs going, they need your support! For more information on the various ways you can help, visit their website here. We all get extremely busy in our lives and sometimes are on autopilot. But just a small gesture can make a big difference in someone’s day. Click here to learn more about how just a small random act of kindness can cause a domino effect that makes the world a better place. Each night, hundreds of youth in the Omaha metro are homeless. Many of these youth have been physically, emotionally or sexually abused, making it unsafe for them to return home. Youth Emergency Services (YES) provides the resources, support, and guidance that these young people need in order to turn their lives around. Learn more about them and how you can help support their mission. Heartland Hope Mission strives to be more than a pantry by providing clients with resources to be food secure and self-sufficient in a hope-filled environment. It is a faith-based 501(c)3 charitable organization that provides basic necessities and services to help the working poor get back on their feet. Learn more about their mission and how you can get involved. The Open Door Mission is one of our community’s most active and impactful organizations helping people find their way out of homelessness and poverty. Just a small contribution of your time or resources can go a surprisingly long way. Learn more and get involved here. Jenny Johnson and her husband, Alan, started this ministry to help serve the homeless in Omaha by serving hot meals across the street from the Downtown Library on 14th & Farnam every Wednesday. Jenny and Alan work with volunteers to cook the food, serve the meals, and pray for the homeless. To get involved, please contact Jenny and Alan Johnson at johnsoal2@cox.net or call Jenny at 402-350-5705 or Alan at 402-350-5704. Saying “Thank You” to First Responders. Police and firemen are our community’s unsung heroes. They put their lives on the line for the health and safety of our community everyday and we encourage you to find small ways to reach out and say thank you for all that they do for us. The Autism Society of Nebraska. The mission of the Autism Society is to improve the lives of every family affected by autism. The focus of the Nebraska Affiliate is working locally and regionally throughout our Nebraska autism community. 100% of the funds raised here in Nebraska stay in Nebraska. Learn more and get involved here. The Hope Center for Kids. The Hope Center for Kids provides a safe after school and summer program where kids can take part in academic support, youth development, employment training, and get a hot meal. Learn more about this wonderful faith-based organization here.